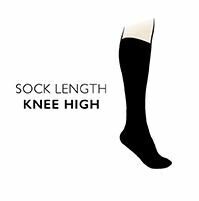 When you want some luxury, you need look no further than these gorgeous Cashmere knee highs from Pantherella. The softly ribbed legs make them secure and fitted without the need for tight elastics, and the hand linked toes for smooth seams make them kind to the feet too. Pantherella Cashmere socks aren’t just exquisite to the touch, but exquisitely made too, knitted with a particularly high percentage of Cashmere (85%), with a small amount of Nylon added to make them more wear-resistant and to enhance the fit.